You want to be more flexible and experience the many different styles created by hair extensions but you do not know how to choose. So come to clip-in hair extensions, you can meet all. I have a lot of questions about clip-in hair extensions. I will answer all your questions about those issues. You have a great question about how to clip-in hair extensions. If you are still confused about that then come to us- Layla Hair. This will be a great place to give you the information about hair extensions in general and clip-in hair extensions in general. If you find this information extremely valuable and useful to you because usually when using the clip-in hair extensions you are not surprised and confused because The information below will provide you with all the necessary steps to use the clip-in hair extensions. Many people will take a lot of time when they want to have a hair extension will have to go to the hair salon to be able to give yourself a hair extension as desired. So you just follow my instructions below, you can easily create yourself a clip-in hair extension at home. You will not need to create too much unnecessary damage to your hair, not annoyed by unwanted hair extensions. Let follow my share below. What is a clip-in hair extension? Before coming to the first step, you will need to prepare yourself for the following tools in order to obtain a clip-in hair extension: a full set of hair extensions and extensions to suit your hair and tastes, a mirror, a clip and a brush. 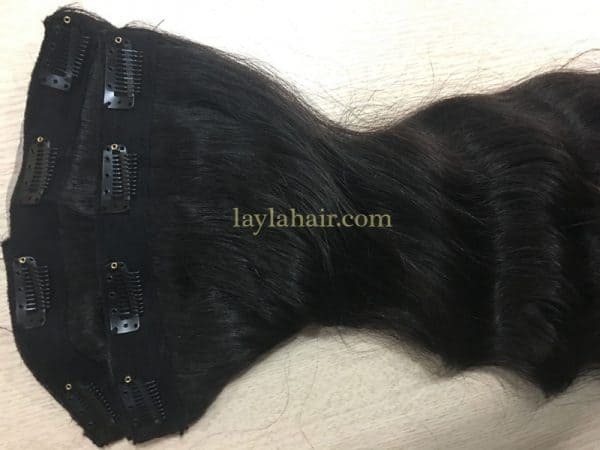 To the hair extensions clip at Layla hair, you will be very pleased and love it because each clip has a silicone grip that will help us to tightly attach to the tightly. hair without falling out. All you have to do is click to open and click back to close. With clip-in hair extensions, you will not be constrained and bound to a style that is taped, bonded, or glued to the hair, which you can implant anywhere on your hair. You can flexibly adapt to different hairstyles to suit your tastes and circumstances. You can enjoy the full range of hairstyles you want and are really new every day. First, you should untangle your hair so straighten by using a soft brush to prevent your hair from being damaged. A thin section of hair with a finger or a combat the nape of your neck and the clip. rest of your hair away by a hair clip. You have to clean it before clip it to your hair. Start from the bottom and work your way up the weft using a soft paddle brush. This weft soft paddle will help you get rid of the mess of the hair clip. To achieve the most perfect beauty, you must measure the width of the clip-in hair extensions to match your current hair so that it does not lose its beauty and worsen your beauty. Next, find the center of your head and clip in the middle two clips into the roots of your hair first, and then follow by clipping in the side clips. Make sure there are no bumps in the weft by slightly stretching the weft to the sides when you’re clipping in the middle clips. I will continue to share my experience on a clip in hair extensions for the next few posts. Keep up the look and look forward to my next article. I assure you that clip in hair extensions are a good choice For those who are very personal and flexible and always make themselves new everyday and everywhere. Why do you need a human hair topper? The difference between 100% natural human hair and remy hair? You should find the center and clip hair extensions on it. Remember that the closer a hair clip is to the hair, it will make it easier for you to move and prevent the clip hair from getting out of your hair and make you more natural. To make it easier and to prevent the clip from sliding down too far. And try pulling that section slightly away from your scalp to have some leverage. Or simply tease it to create a more secure base. After completing the center, you will do the same for the right and left sides to get a clip in hair extensions. Separate a straight thin section of hair above the first clipped weft, and clip the rest of the hair away with a hair clip. Take the smaller 4 clip weft. Brush it from the bottom up to make sure there aren’t any knots. Measure the weft against the sectioned portion to make sure it will fit perfectly on your head. Thanks for always interested in the article.